​Students who successfully complete this course will receive a certificate for Adult and Pediatric First Aid/CPR/AED valid for two years and a printable certificate that they can share with potential employers. 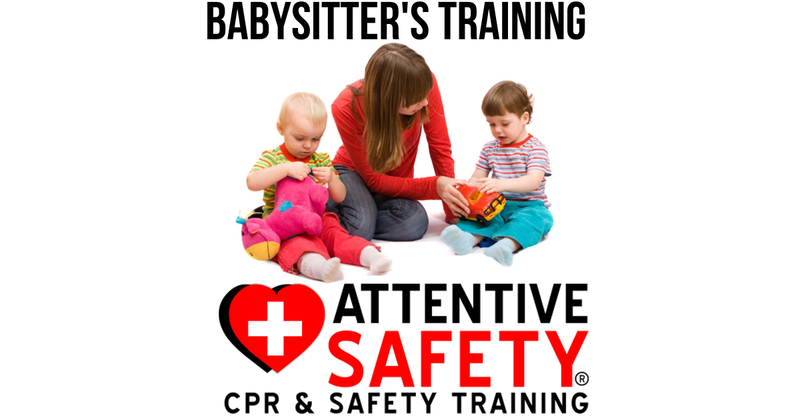 ​Earn your Babysitting Certification from Attentive Safety CPR and Safety Training. Whether you're just starting out or you've cared for your siblings for years and now want to start earning money or even build a business, our programs can help. By allowing you to demonstrate your skills to the families seeking your help, an Attentive Safety CPR and Safety Training Babysitting Certification shows parents that you take your job seriously. Designed and taught by experts, Attentive Safety CPR and Safety Training Babysitting Certification course materials are interactive, informative, and fun. Created to help you provide the best care possible, our program can help you deliver compassionate care, and learn to interact with infants and children in fun, age-appropriate ways. This way, you can build a rapport with the children you care for, learn to understand them, and tailor your care to meet the family's needs. Take care of the kids in your neighborhood when their parents can't be with them. Babysitting Certification from the Attentive Safety CPR and Safety Training can help you not only learn to watch over children while they're in your care, but it can help you build leadership and decision-making skills, choose age-appropriate activities, understand behaviors and give you the tools needed to help manage them, and more. Our in-person training courses are developed and delivered by experts in the field and can help you become a babysitter that families can rely on.